Cirque du Soleil is returning to Australia next month with Quidam, one of the company’s most loved, classic shows. Playing in arenas, Quidam will commence its Australian tour in Canberra on 10 December 2015 and will then travel on to Wollongong (from 23 December 2015), Hobart (from 6 January 2016) and Newcastle (from 15 January 2016) with limited seasons in each city. After finishing in Korea on November 8, the tonnes of equipment and over 250 costumes will be packed up and shipped to Australia. The artists and crew are looking forward to spending summer in Australia and experiencing a Southern Hemisphere Christmas. The story of Quidam is about Zoé. Young Zoé is bored. Her parents ignore her. Hidden in the crowd of today’s modern society, her life has lost all meaning. Seeking to fill the void, Zoé slides into an imaginary world, the world of Quidam, where she meets a host of curious characters who encourage her to finally free her soul. For those planning on holidaying on NSWs south coast over the Christmas/New Year period, the Wollongong season of Quidam offers a unique family entertainment experience. There are shows on Christmas Eve, Boxing Day and two performances at 2.30pm and 6pm on New Years Eve. The WIN Entertainment Centre is then only a short walk from the waterfront and Belmore Basin to enjoy Wollongong City Council’s New Years Eve fireworks at 9pm. Since premiering under the Big Top in Montreal in 1996, Quidam has captivated millions of people across five continents. The international cast features 46 acrobats, musicians, singers and actors who present a showcase of spectacular aerial feats, astonishing human agility, and heart-warming emotion. 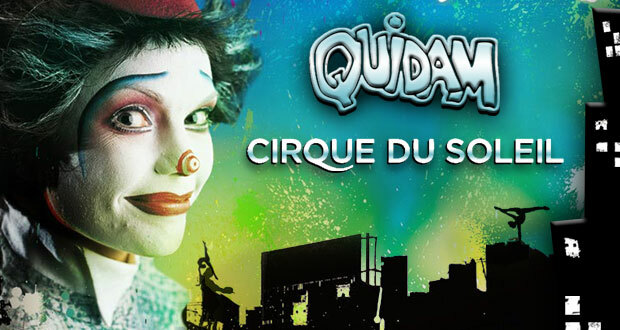 Tickets to see Quidam would make a unique Christmas present for loved ones!! Tickets are on sale now at www.cirquedusoleil.com/quidam. Prices: Tickets $75 to $165 with discounts for children aged 2 to 12 years and Groups 12+. For complete show and ticket information, please visit www.cirquedusoleil.com/quidam. Cirque du Soleil gratefully acknowledges DHL and XEROX as the official sponsors of the QUIDAM Australian tour.